As one who has expertise in groundwater hydrology, hydrogeology, resource economics, and politics, I am struck by the insanity of many of those people identified in this article. The Middle East agriculture companies could be called immoral, yet their theft was fully sanctioned by the State of Arizona. Their advantage was being well informed; they saw the proverbial bank vault door wide open with a sign saying … help yourself! The problem (as the great late 19th century economist Henry George would say) is private ownership of natural opportunities such as water, groundwater, and the land itself – private ownership of buildings and improvements must always be protected. Even worse than private ownership of natural opportunities is non-ownership, or what is known as “open access” resources. 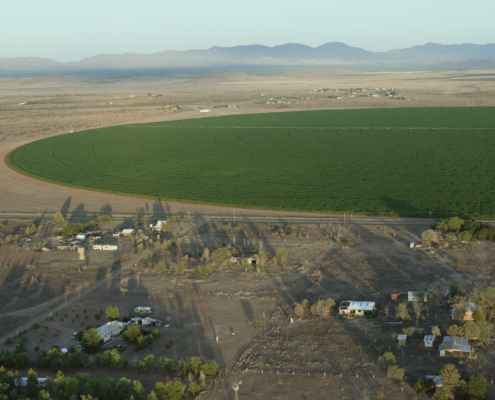 The groundwater under Sulphur Springs Valley, Arizona was for 20,000 years a common resource; its value was kept at near zero until it was increasingly pilfered by large, corporate agriculture. Incredibly stupid. The opposite of insanity – resource planning and common property management – would have identified a resource rent amount to bring about a groundwater withdrawal safe yield. As is done in other Western States, a water master monitors use and adjudicates toward that yield. Over pumping is collapsing the aquifer sands in places 15 feet; this will continue until this environmental infrastructure is totally destroyed. Yes, this situation CAN and IS getting worse. As it is in so many situations where people continue to privatize natural opportunities, the patients will run the asylum, while the administrators pick up and leave the victimized locale, looking for new looting opportunities. It is so sad, but totally preventable.